As you can see below it wasn’t a total disaster. I slide the cake into place to take better photos but before-hand it was a real leaning tower of CAKE! I must add if were serving this cake to company…I’d probably start over but that’s just me. If you’d like to know how to properly frost a cake…see the steps I took below…just choose to do it on a cooler day!! *helpful note* Make sure your cakes are completely cooled. If not, you will pick up crumbs from the cake while you frost. You may also chill your cakes in the freezer before you start! Step#1- Prepare cake according to box mix directions to make 2 round cakes. Choose any cake mix you’d like or spice cake for an autumn flavor! Step#2 & #3- Take a bread knife and slice off a thin layer of the top of the cake. Do the same for both cake tops. Step #4- Smear a small amount of the frosting on your cake plate. This is to hold it in place. Step#5-Place one of the cakes upside down onto the cake plate. Again, you are going to place the freshly cut side down leaving the flat side of the cake, up. Step#6 & #7- Smear a nice amount of the frosting on the top of the cake. This doesn’t have to be perfect, just enough to cover the top. Step#8- This is a repeat of step #5. Place the second cake on top of the first cake. Again, freshly cut side down. Step#9, #10, #11- Generously smear the rest of the frosting on the top, edges and sides of your cake. *Note* Work in small batches with plenty of frosting so you don’t have any thin spots. The Best Strawberry Compote, Ever! Seriously, this will be one of the BEST desserts you’ll ever make and it may just even replace dinner all together. If you plan to make your own cake, bake it ahead of time and set aside to cool. If you would like to punch up the cake flavor, add about 1 tsp of vanilla extract to the cake mix…yum! Next, wash the strawberries and remove the green parts. Cut each berry in half and place them in a food processor. Add some brown sugar and 1-2 tsp of the vanilla and blend until you have a nice puree. Taste the mixture and adjust the amount of brown sugar to your liking. Tastes good already, huh? Now, for the whipped topping, pour the heavy cream into a mixer and add some of the brown sugar. Mix until you have a somewhat stiff consistency. Be careful not to over mix unless you like it that way. Taste the cream and adjust the sweetness by adding more sugar to your liking. Now that your cake has cooled, slice the cake into generously sized square cuts. Pour the strawberry puree on the top enough to cover but with a little cake exposed on the side. (see featured image) Now, add a healthy dollop of whipped cream to the top and you’re ready to serve. Garnish with a sprig of mint, optional. Last weekend I took a trip to Topanga Canyon. The Strawberries used in this recipe came from a stand on the side of the road. 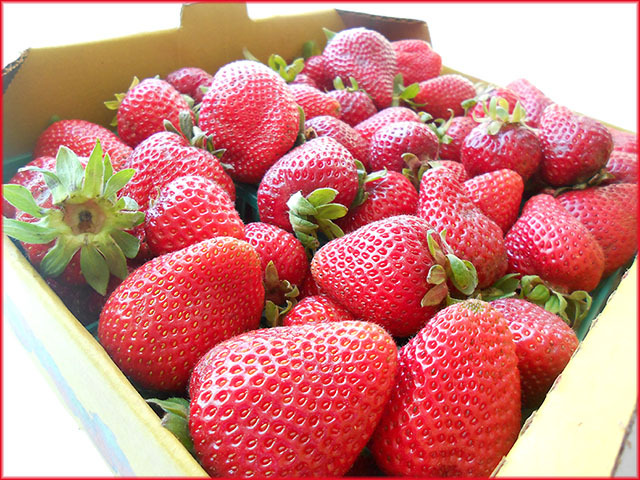 ( just look for the strawberry sign) The WOW in the dessert really starts with a good batch of berries. As you can see the color is beautiful and they were so fragrant. If visiting Topanga is not an option try your local Farmer’s Market, they should have some great choices there!